Cushing Public Schools paid for the construction of its softball stadium with money from the building fund. Oklahoma education leaders say a state question designed to give districts more spending flexibility will do little to improve public schools’ financial difficulties. State Question 801 would allow school leaders to spend money in their building fund — currently restricted for things like construction projects, maintenance and repairs, utilities, and custodians’ salaries — in new ways. State Sen. Stephanie Bice, R-Oklahoma City, who authored the legislative referendum that became the November ballot measure, said if SQ 801 is approved, districts would be allowed to use the funds for operating expenses and teachers’ salaries. But Shawn Hime, the executive director of the Oklahoma State School Boards Association, doesn’t think the measure provides a fix many districts need. Cushing Public Schools Superintendent Koln Knight said he doesn’t know of any school leaders pushing for this either. “Most superintendents are puzzled as to where this came from,” he said. Knight said districts don’t have large amounts of money trapped in building funds due to spending restrictions. Instead, he said schools need and use all the money in their building funds for building-related expenses. If voters approve SQ 801, he said Cushing schools will continue spending building funds as originally intended. 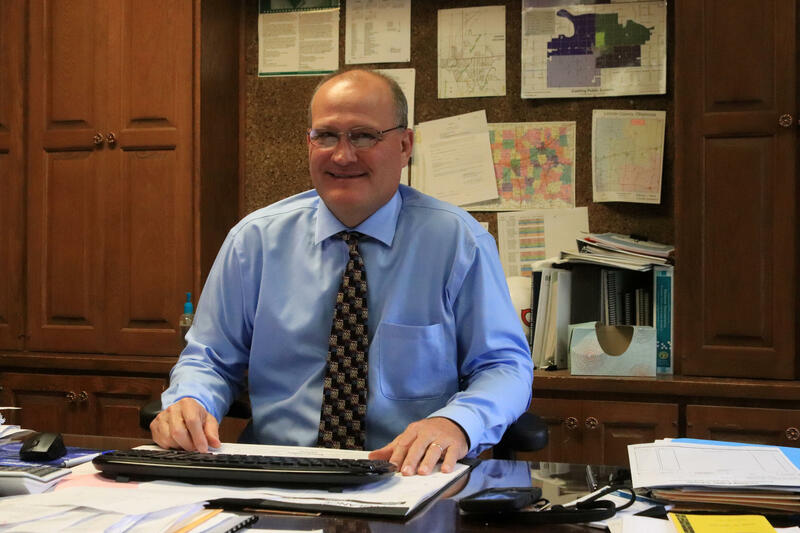 Koln Knight is the superintendent of Cushing Public Schools. Knight said SQ 801 wouldn’t create a new funding stream for public schools. It does not allow districts to pass bonds to pay for teachers’ salaries, for example. Knight said the measure simply allows schools to shift money from one account to another. “Changing how you can spend the money between the two doesn’t add a dime,” he said. The bulk of the money that goes to public schools comes from a funding formula that distributes state-dedicated revenues and legislative appropriations. Building funds, however, are generated by local property taxes, and the amount schools receive is largely determined by the value of the property within their district boundaries. 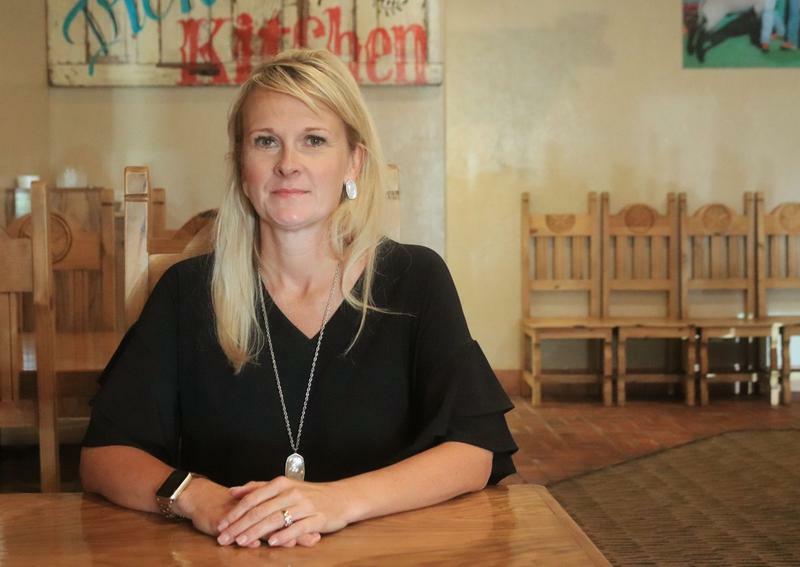 Because districts with higher property values can accumulate more substantial building funds, Oklahoma Education Association President Alicia Priest worries funding disparities between rich and poor districts will grow if voters approve SQ 801. In a statement opposing SQ 801, Priest also said that building maintenance could be neglected if schools are allowed to tap those accounts to pay for teacher salaries and other classroom expenses. Jennifer Monies, the Director of Oklahoma Achieves, a workforce development arm of the Oklahoma State Chamber, supports SQ 801. She said it eliminates arbitrary and government-imposed restrictions on how schools can spend their money. “We believe local communities can best decide what to do with local dollars,” she said. Tulsa Mayor G.T. Bynum is another supporter. He said a “yes” vote would not force schools to spend the money in their building fund on teacher pay, or anything else. It just gives them more budgeting options. Bynum and other supporters said SQ 801 is not a solution to Oklahoma’s education funding woes. He calls it a “toe in the water,” and wants schools to have even more freedom in how they can spend local property taxes. Bynum said districts should be able to pass bond issues to raise teacher salaries or increase classroom funding — something state law currently prohibits. Bynum said Oklahomans have waited long enough for lawmakers to give schools more money. He said SQ 801 is a first step in giving communities more control over their districts. Oklahoma’s State Board of Education is set to approve a record-breaking number of emergency teaching certifications at its meeting Thursday, a strong indication a statewide teacher shortage is still growing. Results from a new survey show the recent teacher pay raise has had little immediate effect on the state’s teacher shortage, and that schools will still start the year with nearly 500 unfilled positions. 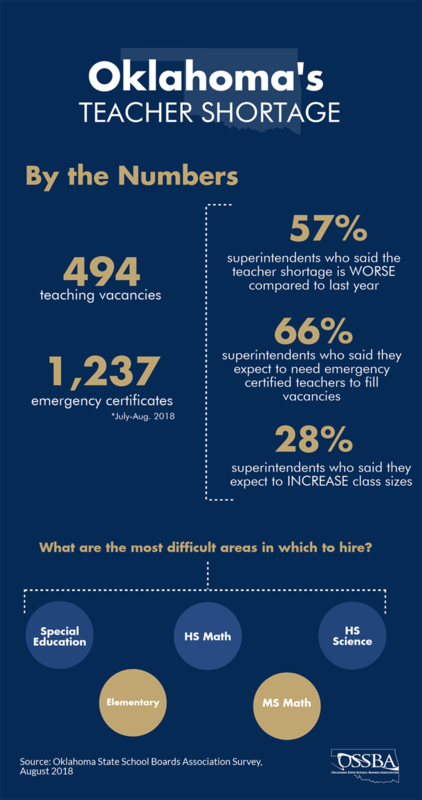 276 superintendents responded to the Oklahoma State School Board Association’s survey on the teacher shortage. About 100 teachers and school administrators filed for political office in the 2018 election. Most are not shy about supporting the first tax increase in nearly three decades, even though it’s a progressive political message in a deeply conservative state. Pro-tax campaigns from educators seem to be resonating with voters in many parts of Oklahoma — but not everywhere.